1. Matching coefficient of thermal expansion to a mating material. 2. Thermal conductivity for heat sinks. 3. Density for RF shielding. 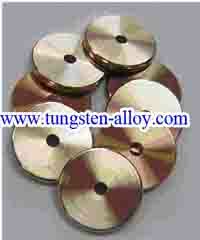 Tungsten copper alloy is a metal with a distinct reddish or orange tint, with a metallic luster. The cubic crystalline structure is face-centered, and reflects only red and orange colored light from the visible spectrum, giving it the familiar reddish hue. Compared to adjacent metals in the periodic table, copper is harder than zinc but softer than iron. The metal is malleable, meaning that it can be elongated with pressure and molded into different shapes. Copper is also ductile, which enables it to change form and be stretched into long thin structures without breaking. Tungsten copper components properties, along with its ability to conduct electricity extremely well, make copper suitable for use in electrical cable manufacturing, where these physical attributes are particularly desirable. The atomic number of copper used in wires is 29, meaning it has 29 protons. Copper's symbol is "Cu," and its atomic weight is 63.54. Copper is placed in column 1B in the periodic table, along with silver and gold, whose symbols are "Ag" and "Au," respectively.Tungsten copper components have a Moh's hardness (a system of measurement to evaluate the hardness of metals) of between 2.5 and 3. Tungsten copper components used in manufacturing wires has a very high specific gravity of 8.2, which is much higher than other substances of industrial interest, such as water (1.0), carbon (2.2) and sulfur (2.1). The specific densities of silver and gold are both higher than copper, at 10.5 and 19, respectively. Copper wires have low chemical reactivity; in reaction with other elements, laboratory copper has a charge of +1, known as cuprous or +2, known as cupric. 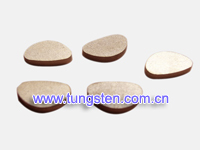 If you have any interest in our tungsten copper components, please feel free to contact us by email: sales@chinatungsten.com sales@xiamentungsten.com or by telephone: 0086 592 5129696, we are at your service at all times.